Attend our SPE courses to learn new SPE information. "Utterly demystifies the job (no longer the art) of performance engineering. Monsters, begone! Wizards, away! It leaves you feeling that you could really do this on your own. And, thanks to Connie and Lloyd, you can." Performance Solutions is published by Addison-Wesley (ISBN 0-201-72229-1) as part of the Object Technology Series. You can order it from Amazon. We are considering creating an electronic version of the book. Let us know if you would be interested in an Amazon Kindle or other type of electronic version. Performance Solutions offers straightforward techniques and strategies that can be used by software developers, project managers, and performance specialists to manage the performance of software throughout the development process. In particular this book focuses on how to design performance into software systems early and then maintain performance throughout the software development life cycle. Numerous real-world applications and case studies illustrate the application of SPE techniques to important application domains, including Web and embedded real-time systems. With this book, you will gain the understanding and skills you need to make informed choices among architectural and design alternatives and create responsive, scalable software on time and within your budget. "Software performance is an important area of concern for practitioners. Even so, very few books have been published about it, and these books have been so mathematical in their presentations that few readers have been able to understand or apply them. 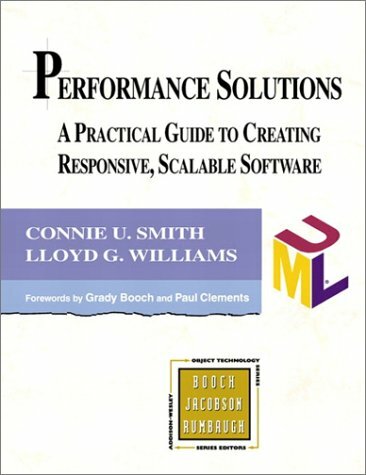 During the pre-publication review process, it became very apparent that Connie Smith and Lloyd Williams were writing a software performance book that would be accessible to a much wider audience, and that they were doing so without abandoning rigor or integrity." The original book by Smith on Performance Engineering of Software Systems is unfortunately out of print. You may be able to find a copy through a used book store or university library. There is an extensive list of additional publications on SPE. We also offer a full range of performance consulting and mentoring services to help you get started and to manage new technology. We offer training to help you learn the SPE methods and techniques. The SPE•ED™ product enables you to conduct performance studies quickly and easily. Copyright 2002-15 All rights reserved.